ArchitectureCraft (formerly called Greg's Blocks) is a mod for the game Minecraft. It provides blocks for creating various architectural features that can't otherwise be achieved easily or at all. Currently included are blocks for building sloping roofs, pillars and rounded corners, and windows with frames. ArchitectureCraft is a Forge-based mod, so if you haven't done so already, you will need to install Forge. See the Download section below for recommended versions. 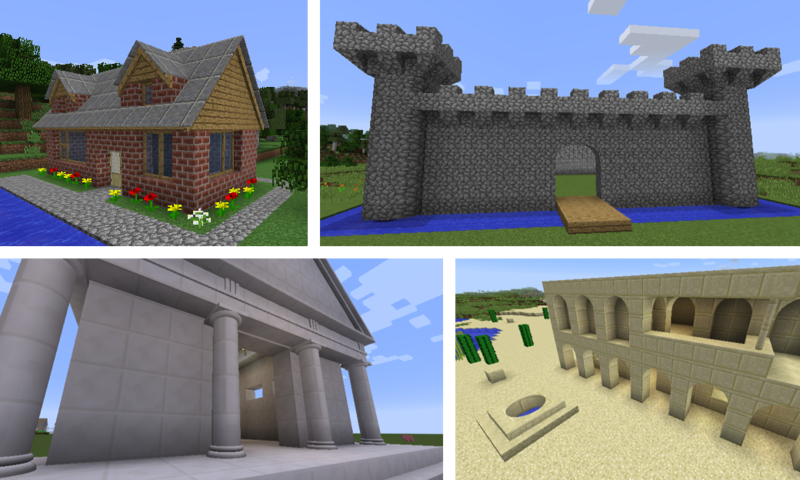 ArchitectureCraft has been tested with the following versions of Minecraft and Forge. It may or may not work with other versions. Forge Version listed is the one the mod has been developed and tested with. Other versions may or may not work. Copy the .jar file into your mods folder. Copy the .jar file into the server's mods folder. See the User's Manual for detailed instructions. For mod developers -- you don't need this just to use the mod. For source of previous versions, see Old Versions. This is free software. Copying, distribution, creation of derivative works and inclusion in mod packs is permitted without restriction. French translation added courtesy of Louis Bailleau. 1.10.2: Fixed "tile entity cannot be cast to gcewing.architecture.ShapeTE" client crash caused by attempting to place an ArchitectureCraft block in a space partially occupied by another type of block having a tile entity. Improved checking of tile entity classes. 1.7.10: Fixed client crash rendering a block whose raw material belonged to a mod that has been removed or had its block name changed. Such blocks now revert to being made from wooden planks. Recognise Chisel transparent blocks as raw material. Improved compatibility with mods that mine blocks automatically. Changed recipes for Hammer and Chisel to make them more distinctive and less likely to conflict with other mods. Restored ability to use half-slabs as raw material. Will use two slabs for each batch of output. Fixed: Mined shape blocks sometimes failed to stack with other blocks of the same type. 1.7.10: Fixed shading of curved surfaces on blocks held in hand. Fixed: Shift-clicking result slot in sawbench spammed inventory with duplicate items. Shift-clicking now supported in sawbench. 1.10.2: Fixed bug causing double material usage in sawbench. 1.10.2: Prevented non-cubical blocks from being used as raw material. Fixed smooth shading of pillars and cylinders. Fixed cladding turning into a full block when breaking a clad block. Fixed placement of banisters on ArchitectureCraft stairs and upside-down vanilla stairs. 1.8.9: Guard against "net.minecraft.block.BlockAir cannot be cast to gcewing.architecture.BaseMod$IBlock"
Added stair and slab blocks. Fixed rendering of cladding on transparent base materials. 1.7.10: Fixed orientation of projected textures on east/west faces. 1.8.9: Fixed inventory rendering of cladding made from some types of wooden logs. Glass, ice and other transparent blocks can now be used as raw material. 1.7.10: Fixed crash caused by Chisel animated textures. 1.7.10: Fixed index out of bounds in onTextureStitchEventPre when used with some other mods. Fixed orientation of roof blocks placed against existing upside-down roof blocks. Fixed server errors concerning collision boxes. New blocks: Railings for balconies and stairways. Fixed crash when breaking shaped blocks made from some vanilla materials. Fixed a texture corruption bug. Initial version for Minecraft 1.8, based on Greg's Blocks.